The relationships shared by Leo and Pisces are simultaneously fascinating and frustrating. As Leo and Pisces are two markedly different people in almost all aspects of life, conscious efforts to understand each other and to make adjustments are necessary in order for their relationship to be harmonious. Leo are warm and generous people who thrive in helping the underdog and defending the defenseless. They also possess a natural dignity and insight; however they make up for such wonderful qualities with their arrogance. Leo always have a goal in mind and work towards reaching that goal. They cannot fathom anyone not having such ideals. Regardless of how far fetched the goal is, the Leo strives towards that goal whether they do it themselves or delegate tasks to others to get it done for them, the latter being the more predominant for the Leo. Almost everyone in their company adores them. The Leo are often one of a kind, very honest and loyal people who are very sensible and extremely practical. They always remain the natural leaders with a long fan following behind them. Pisces are very adjusting people with submissive attitude and avoid conflicts. They use all these qualities as their strengths rather than weakness. They are the humble creatures who enjoy helping and serving others. Pisces are very observant and examine each person and situation closely. Pisces are creatures who are easily enticed by temptation and intrigue. They need the time and space to look at, look into and try different things from all angles to see if that is the way they should go. They often have trouble trying to figure out just what that is. If they don’t have the space they need to make a valued decision, they tend to take everyone’s advice and try to follow it all, whether it is good or bad. Leo crave, expect and demand admiration and adoration from others and best to give such esteem to them are Pisces. Their charming personalities deem them very good at what Leo expect of them. No one can bring the loyalty or generous charm out of Leo like a good Pisces compliment. Leo’s charm and beaming qualities shine through brightly for Pisces’ tender nature that needs protection. There is no one better to take care of Pisces than Leo and their protective and loving qualities. Between Pisces charming compliments and Leo’ ability to take charge and make decisions the union formed between the two is always a strong one. They are able to encourage each other as well as compliment each other. The essence of what is created is a comfortable, deep and blissful one. They work well together in any instance, whether it is in business or any other aspect in life if they just give it a good effort. Pisces must remember, when dealing with Leo, they should throw in an occasional praise, as long as it sounds sincere, and admiration in conversing with them. This makes Leo better people in aspect of generosity and in loyalty. It also tends to soothe the arrogance when they need to be softened. Leo should realize that a gentle hand is sometimes better than aggression and authority when dealing with Pisces. There is not a lot of contrast between Leo and Pisces. They tend to get along quite well and easily adapt to each other. The outward dominance of Leo, even if they try to tone it down to a gentle touch, is accepted by Pisces more than they let on. Their submissive nature welcomes Leo’ control as long as it is put forth with affection and love. Leo and Pisces can share many colors in all the relationships they make with each other. Their rapport is a fantastic one except for a few minor tiffs that vary from relation to relation. As siblings, friends, colleagues and relatives they work quite well and Leo usually have the upper hand as the Pisces admires and follow them. 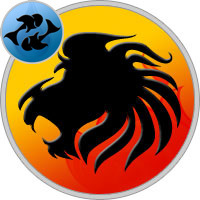 There is hardly any competition as Pisces remains satisfied with protective care of Leo and Leo keep enjoying their authoritative position. In business also they can work well but the problem comes in finances as Pisces are a bit messy with finances and Leo are extravagant and hence can cause problems in long term. Love life and married life of Pisces and Leo go on smoothly and lovingly till Pisces remember to admire Leo and Leo stays gentle and calm. Parenthood comes to Pisces naturally as they are very caring and submissive from the beginning and to Leo also it remains authoritative job which they love to do. So both of them make great parents and obedient kids as well. Pisces and Leo have smooth relationship to an extent after that some troubles may creep in. Leo always find Pisces very loving and submissive not only top them but also to others. This makes them insecure and makes them feel no more special as compared to everyone around Pisces. Pisces on the other hand can find Leo very arrogant and reactive at times which threatens their fragile heart and makes them depressive. The relationship between Leo and Pisces can be a strong one with a little effort from both the sides. Leo have to tone down their control and show a more gentle hand toward Pisces in keeping them calm and less nervous. Pisces need to show a bit more admiration and compliment the Leo more so than what they are accustomed to doing. When marriage happens between a Leo male and Pisces female, he always tries to set rules for their relationship. He loves to exercise his control over their marriage so that he doesn’t feel insecure. She also very happily surrenders herself to her man because of her love. Before entering into a marital bond, both partners need to understand and analyze the level of loyalty, devotion and love they can invest in their relationship without hurting the other one. But once they are able to make a decision, they do complete justice to it. With time, their bond strengthens as the level of trust in their relationship increases. Both the partners are able to bring positive changes in each other’s personalities with their love. She teaches him to be more humble and he guides her to focus better. They are able to experience freedom and personal space in their relation which makes it all the more beautiful. Together they are able to experience the deepest oceans of love and climb the highest mountains of trust. With time, they are able to transform into a more mature and reliable couple blessed by the Almighty.